When considering The National Geographic Channel’s latest offering In “The Killing” series based on the books by Bill O’Reilly, I was reminded of a certain Spaghetti Western film. The Good: The presentation of Jesus was refreshingly genuine, personal, and ethnic. Rather than the stale, stiff, Eurocentric casting and presentation of Jesus, Haaz Sleiman depicts Jesus as a middle eastern man who exhibits genuine emotions including a sense of humor and a true connection with the people to whom he ministers. In contrast to many other presentations of Jesus as distant and disconnected, Haaz’s Jesus is the Word who truly became flesh, living among us, as us. The Bad: In contrast to the casting and acting of Haaz, Stephen Moyer’s casting and presentation of Pilate, and Tamsin Egerton’s presentation of Pilate’s wife Claudia, is forced and out of place. Additionally, in stark contrast to most of the scenes and dialogue of Jesus, the scenes depicting life in Pilate’s house and Herod Antipas’s family is cheesy, having more of the feel of a late night offering from Cinemax rather than a serious narrative of the life and death of Christ. The Ugly: The inaccuracies of scriptural accounts are startling and confusing. While one expects some speculation of non-canonical filler material, what is not expected, nor should it be tolerated, in a project that is presented as “truth revealed,” are changes to events narrated in the Gospels. In Killing Jesus there are too many major changes to Scriptural accounts and actions. As depicted in Killing Jesus there was no divine expression, no voice or indication of the Holy Spirit to Jesus or those witnessing his baptism. Unlike Gospel accounts the baptism indeed was private, with only Jesus and John participating. In contrast to the presentation in the film, there is no indication in John’s Gospel that the woman accused of adultery had been found guilty by a high court. In the Gospel, she was about to be stoned by a mob without a trial. The Gospels narrate that it was Pilate’s guards who put the crown of thorns on Jesus and mocked him, not Herod’s palace guards as is presented in the film. In Matthew’s Gospel, Judas returned the 30 pieces of silver to the Temple, or in Acts purchased a field. Killing Jesus depicts Judas using the money to purchase the rope from which he hangs himself from a shepherd boy who then uses the money to purchase a white horse. At best these and other changes to the Gospel accounts are distracting to people who know the story and, at worst, become the story to people unfamiliar with the texts. Though some may consider such changes as minor and not important, students of Scripture, as well as literature and film, know that there is meaning behind every element, action and word. To make such changes is to alter the meaning of the story. 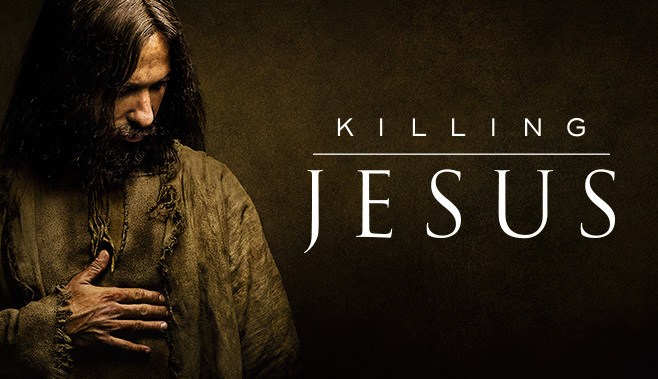 Overall Killing Jesus is a mixture of mistaken use of scripture and a script that contains many eye rolling, cringe worthy lines and scenes, sprinkled with occasional poignant depictions of a fully fleshed Son of God. Had Mr. O’Reilly reviewed this film at the beginning of his career when he was a movie and entertainment critic, I cannot see that he would have given this film anything but a very poor review. One final mystery is the fact that this flawed film stands in contrast to the usually stellar, fact based and accurate programming on the National Geographic Channel. This entry was posted in Film Shots and tagged Bill O'reilly, jesus, Killing Jesus, Killing Jesus review, National Geographic channel, scripture. Bookmark the permalink.